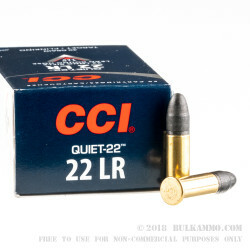 CCI is well-known for their superior quality .22LR ammunition. This new production, non-corrosive round from CCI, released in 2012, continues that legacy of high quality with a quieter, lower-velocity round. With a muzzle velocity of 710 fps, these rounds are designed to produce much less sound than a standard .22LR round. In fact, when used as recommended by the manufacturer in a bolt-action single-shot rifle, the manufacturer claims that each round will create no more than 68 decibels of noise at the shooter's ear. While we always recommend you wear hearing protection, the lower report and reduced recoil associated with these rounds make them a pleasure to shoot for longer periods of time, and make for an easy introduction to shooting for new shooters. These rounds are LRN, which means Lead Round Nose, and do not expand on impact. 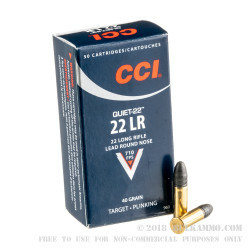 As a result, this CCI ammunition is best for target practice and plinking. 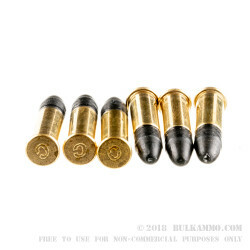 Also, the manufacturer notes that while these can be used in .22LR semi-automatic firearms, manual cycling of the action may be required and these rounds are best used in single-shot rifles. 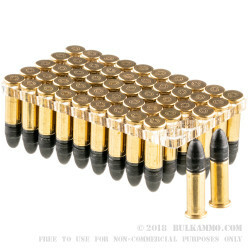 This product is a brick of 500 rounds, in a configuration of 10, 50-round boxes. I wanted to take out my old .22 rifle to finally get my wife to try shooting, I myself had not fired this or any other .22lr in 20 plus yrs. My first shot with it, I thought there was a squib, but it was so quiet. Accuracy was good, and it awaken a desire for another .22 gun, I'd forgotten how fun "just plinking, with a kids gun" can be. No ears needed its that quiet from a bolt rifle. .22 blanks used to drive concrete nails are louder as well as a air gun I have. I am a new fan of these CCI Quiets. Now I would like a better gun to shoot them in. I'd really like to try these with a can, bet its like a mouse fart then. Good Cheap gets here quick. Q: What is the muzzle velocity for this ammo? A: Hello Ed, CCI lists the muzzle velocity of the Quiet round at 710 fps. A: Hello Tim, This ammunition is loaded to subsonic velocities and will typically not cycle a semi-automatic firearm without a suppressor attached.